The late Tom Clancy’s titular superspy remained undercover at the box office this weekend, as Jack Ryan: Shadow Recruit ($18 million) was buried by the Ice Cube-Kevin Hart buddy-cop vehicle Ride Along ($48 million, a new January and MLK Jr. weekend record), Mark Wahlberg’s war drama Lone Survivor (holding strong with $26.3 million) and the cartoon mole and other rodents of The Nut Job (which squirrelled away $25.3 million). Why didn’t Ryan do Jack? Let me count the reasons. 1. A new star was Bourne. 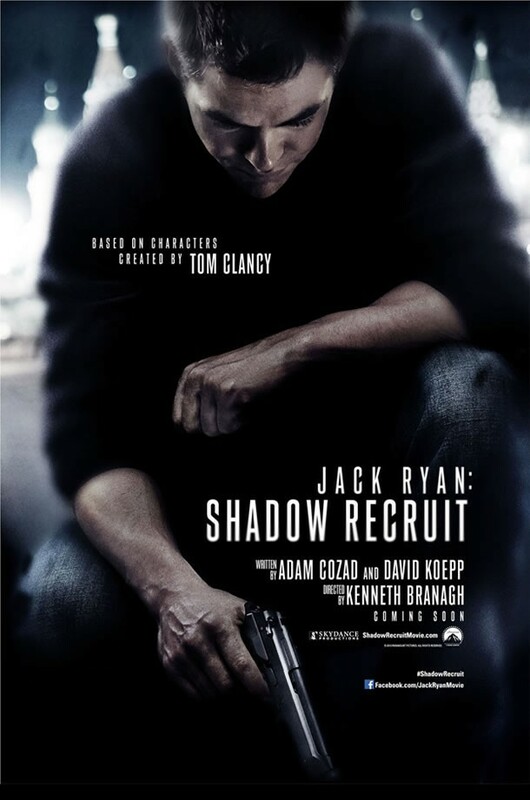 Jack Ryan has appeared in only five films over the last 24 years: 1990’s The Hunt for Red October, 1992’s Patriot Games, 1994’s Clear and Present Danger, 2002’s The Sum of All Fears and now Shadow Recruit. In the dozen years since his last incarnation, a new American secret agent man captured the attention of movie audiences: Jason Bourne. Matt Damon’s Bourne Identity opened two weeks after his Good Will Hunting buddy Ben Affleck’s Sum of All Fears and quickly amassed a much larger sum at the box office. Two increasingly successful sequels and a reboot (Jeremy Renner’s Bourne Legacy) later, the Bourne series had washed the memory of Jack Ryan from filmgoers’ brains. It hasn’t helped that James Bond has also been given new muscle by Daniel Craig, or that Paramount attempted to launch a new action franchise with a similar title, Tom Cruise’s Jack Reacher, causing brand confusion. A whole generation of potential ticket buyers—like, say, my 17-year-old son, have no idea who Jack Ryan is, and they’re not likely to be recruited. 2. Jack Ryan has become the Benjamin Button of covert operatives. Ever since Clancy complained that Alec Baldwin’s replacement Harrison Ford was too old to play Jack Ryan (a controversy I covered in a story for Entertainment Weekly), the character has gotten younger and younger—first, he was a up-and-coming CIA analyst played by Affleck, and now he’s a desk jockey played by Chris Pine who’s unwittingly turned “operational” by an agency mentor (Kevin Costner). He spends much of the movie attempting to download encrypted files from a Russian computer—an activity better suited to The Big Bang Theory than an explosively exciting movie. Don’t let the trailer fool you—almost all of the action’s crammed into it. 3. Chris Pine is almost as wooden as Kevin Costner. Perhaps Paramount is under the mistaken impression that people went to see the Star Trek movies because Pine plays Captain Kirk. The star of those movies is the Enterprise (or J.J. Abrams). The studio should’ve paid attention to the anemic receipts for Pine’s non-Trek movies, like This Means War and People Like Us. The guy has zero charisma, but maybe they thought he’d seem lively compared to Costner. Instead, (to paraphrase my former EW colleague Owen Gleiberman’s review of The Bodyguard), it’s like watching two statues on a man-date. And how did Costner get out of movie jail anyway? Sure, he won an Emmy for Hatfields & McCoys, but that’s TV, and he was even more full of himself than Russell Crowe’s Jor-El as the corny Jonathan Kent in Man of Steel. 4. Keira Knightley needs to do some serious career atonement. Ever since she was cut loose from the Pirates of the Caribbean franchise, the British actress has been flailing professionally, overacting in the futile pursuit of Oscar nominations in A Dangerous Method and Anna Karenina, two of my least favorite films of the last few years. Now she’s gone in the opposite direction, hiding her plummy accent and taking the ultra-bland role as Jack Ryan’s doctor girlfriend. Here’s hoping Knightley’s team-up with brilliant indie auteur Lynn Shelton in the current Sundance sensation Laggies gets her back into her scrappy Bend It Like Beckham groove. 5. Tom Clancy is no Shakespeare. Kenneth Branagh charged out of the gate as a writer-director with his thrilling adaptation of 1989’s Henry V, making Shakespeare feel like a modern action movie. Now he’s made a modern action movie feel like a fusty antique. Shadow Recruit is even stodgier than his logy comic-book movie Thor, and Branagh’s Russian villain seems stuck in the Cold War. He’s a frozen stiff, and the movie is, as the Bard might put it, much ado about nothing. « Why Is Jason Patric Still An “Outsider”?